When J.R. Smith got traded to the Cleveland Cavaliers a few weeks ago in a multi-team deal, many great articles were written commemorating his time in New York. Rather than rehash these glorious moments, I will direct you to this great article by Jason Concepcion at Grantland that does a phenomenal job of celebrating J.R.’s accomplishments both on and off the court. Although there are many, many, many memorable gifs and twitter DMs in that piece, the one thing that caught my attention was the stat that J.R. Smith, a career 42 percent shooter, shot only 39 percent on Sundays. This, explained Concepcion, might have had “something to do with Sunday coming after Friday and Saturday and those games taking place relatively early in the day”. In other words, J.R. might have been doing a bit too much partying and wasn’t able to recover by the early Sunday start times. HSAC has already studied whether teams as a whole play worse on Sunday afternoon, but I figured it was time to study it on an individual level. Given Concepcion’s statistic, I wondered if the two shooting percentages were in fact statistically significant. There is an easy way to calculate this – with a two-sample proportion test. We can test a null hypothesis of the two shooting percentages being equal against an alternative hypothesis of them being different. Doing this, we get a z-score test statistic of a little under -2.5, it being negative because Sunday shooting percentage is less than all of the other days. Doing this as a two-tailed test that leads to a p-value of around 0.01, meaning that this is a very significant result and we should reject the null hypothesis that J.R. Smith shoots just as well on Sundays as he does on every other day. But how does this compare to other players? Where does J.R. Smith rank on the all time list of “Players who Shoot Worse on Sundays” aka the “Biggest Partiers in the NBA” list. Note that this assumes that players shoot worse on Sundays because they’ve been partying, not just because of random noise. While this is probably not the case (more about that later) it is way more fun to view this list as a definitive statistical ranking of the biggest partiers in the NBA. To make this list I used the “Career Splits” page at basketball-reference.com to get day-by-day splits for all available players. From what I can tell, they started keeping track of these splits since 1974, and only players who entered the league after that have a page for their career splits. Because of this, I limited my analysis to players who entered the league after 1974. Then, using these stats, I tested the null hypothesis of same shooting percentage against the alternative hypothesis of different shooting percentage and calculated a z score for each player. I then multiplied that number by -1 (so that a highly significant partier would have a high number) and then made that number a player’s “Party Score”. For example, J.R. Smith currently has a party score of 2.594. Doing this, below are the players with the top 20 party scores. After doing this, it still seems like players without a lot of attempts are making the list. I mean sure, it’s impressive that Corey Beck (who?) managed to shoot 11% on Sundays compared to 45% on all other days, but he only took 19 shots total on Sundays. Even though a z-score calculation takes into consideration the sample size, that still doesn’t seem large enough to draw conclusions about his party life. But what number of shots is enough? Over at Nylon Calculus, Darryl Blackport found that it took around 750 three-point attempts for a player’s three point shooting to stabilize. For all shots, that number falls to around 600 (although it depends on the shot location). Using the number 600 as a cutoff for the minimum number of attempts on Sundays, the final list of the top partiers in the NBA is below. J.R. comes in a disappointing (for him) 2nd on the list, although he is first among active players. There are a couple of all-time greats on that list, including Reggie Miller, Chris Webber, Joe Dumars, and Patrick Ewing. Other notables that just missed the cut include Michael Jordan (40th) and two of the analysts of “Inside the NBA“, Shaquille O’Neal and Sir Charles Barkley, coming in 22nd and 23rd respectively. Actually, it’s worth noting that nearly the entire “Inside the NBA” team is represented – Shaq and Barkley are joined by Chris Webber (7th) and Reggie Miller (3rd). What a night those guys must have when they’re all on set. 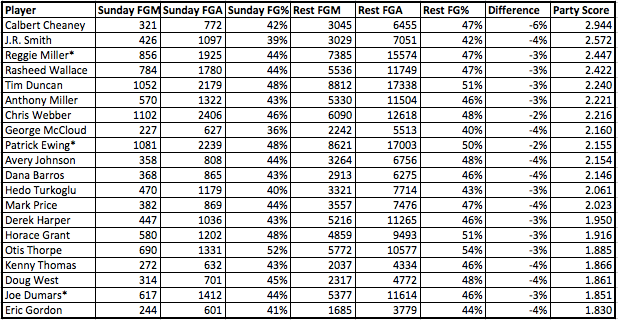 So all this has been fun, but as I mentioned before it is perfectly possible that these players shooting worse on Sundays is nothing but random noise. Although the p-value of J.R. Smith’s shooting splits is a lowly 0.01, the probability that a player in the NBA over that time period doing as poorly is much higher. This is, as Neil Paine explains, “a fallacy of conditional probability known as the Wyatt Earp Effect“. With so many players in the NBA (2035 with at least one shot on Sundays, 320 with above 600 FGAs on Sunday) it is likely, even probable, that we would see someone with a split like J.R.’s. Therefore, this list cannot truly be viewed as a list of the biggest partiers in the NBA, as fun as that would be. Also, it is worth noting that this would actually be more of a list of players who party but can’t recover by Sunday morning. So is there nothing to be gleaned here? Not so fast. If no one were truly affected by playing on Sundays we would expect about half of all players to shoot worse on Sundays and the other half to shoot better. 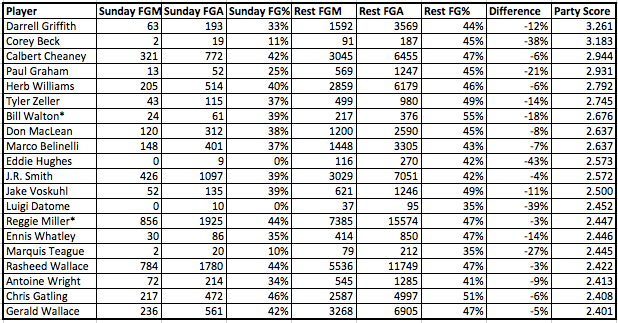 However, among the 2035 players with at least one shot on Sundays, 1092 shot worse on Sundays than they did on all other days. That comes to just over 53%, a number that, when tested with a binomial test against a null hypothesis of 50%, produces a p-value of 0.00103, which is more than enough to reject the null hypothesis. This means that we can conclude that NBA players do shoot worse on Sundays than on other days of the week, although we can’t be sure why. Maybe it’s because they were out partying the night before. Maybe it’s because there are more marquee match-ups on Sundays, leading to players facing better competition and better defense that day (which would explain the presence of Reggie Miller, Tim Duncan, and others on the list) – although there are a bunch of games on Sundays, so if some teams play stronger defenses and others play easier it should even out in the end. Or maybe there’s some other reason entirely; we can’t know with certainty why players shoot worse on Sundays, just that they do. Except in J.R.’s case. We all know why he shoots worse on Sundays. This looks like the perfect opportunity for a funnel plot, which would help distinguish each player’s Party Score, relative to both the number of players in the sample and their sample size of shots.